Phyllium philippinicum, or just called ‘Leaf Insect’ is an insect in the order of stick insects (phasmida) that looks like a leaf. 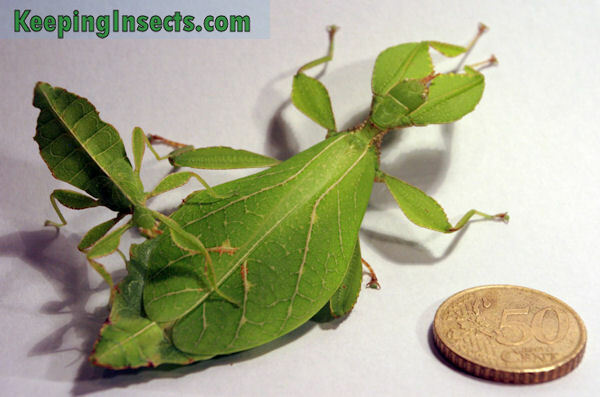 It is one of several leaf insect species, but Phyllium sp. is the one most commonly kept as a pet. 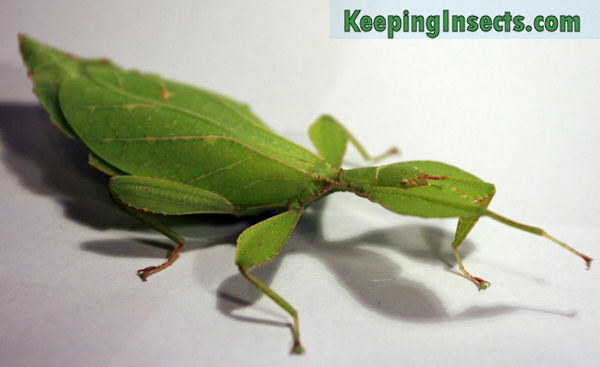 One other species we feature on this website is: Giant Leaf Insect. Phyllium philippinicum is referred to as PSG 278. In nature it can be found in tropical forest in the Philippines. It used to be capped Phyllium sp. phillipines and Phyllium philippinicus. 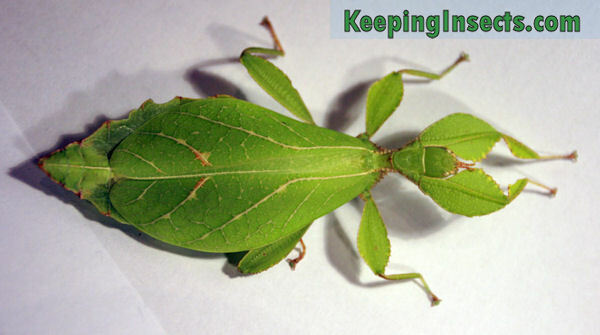 Phyllium philippinicus leaf insect adult female. Brown edges and the like are part of the leaf design! 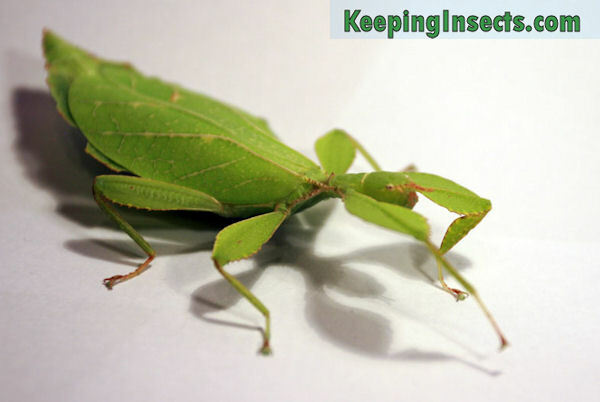 This species of leaf insect is bright green in color and has a body shaped like a leaf. This means it is really flat and broad and has brown spots at the rims of the body. The abdomen shows veins like leaves have and the legs are equipped with lobes. They are often bright green like a young leaf, but occasionally there are brown, yellow or pinkish variants of this species to be found. The difference between males and female is huge once they are adult. The females are larger, thicker and wider than the males. The males are really small and slender. Adult females have broad wings what lay flat on their back, but they lack underwings that are necessary for flight. The males also have very long antennae. When the leaf insects are still nymphs you can already see the difference in body size and shape between males and females. The female will reach a size of about 7 cm and the male of about 6 cm. 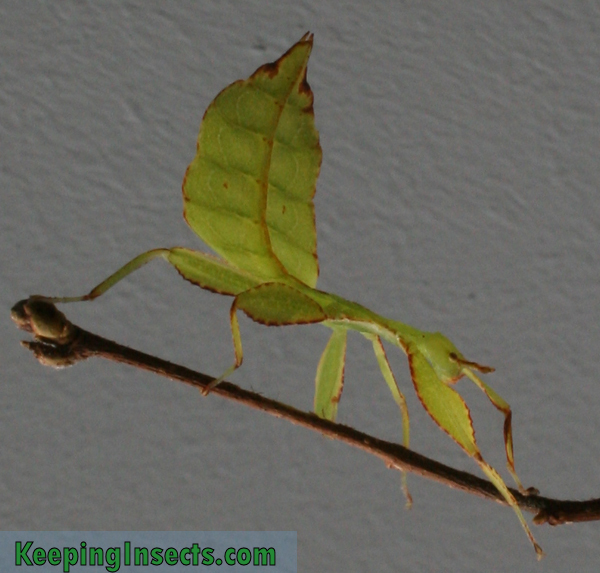 This species of leaf insect eats blackberries, rose and oak leaves. You can check out the pictures of these food plants here. Nymphs are prone to drowning, so make sure you do not provide them with large droplets of water. Young nymphs cannot eat from undamaged leaves, so you should cut of the edges of the leaves to allow them to eat. Phyllium philippinicus leaf insect male and female. Female is adult, male is subadult. The temperature should be between 25 °C and 30 °C. This species needs a lot of humidity, but also a lot of ventilation. Nymphs need to be kept more humid than the adults. Do not allow mold to form. As with all species of stick insects, it needs a cage that is at least 3 times the length of the insect in height, and at least 2x the length of the insect in width. For one adult female this means at least 18 cm high and 12 cm wide, but better is around 30 x 30 x 30 cm. Bigger is always better. If more than one pair is held, 30 x 60 x 30 cm (h x w x d) is recommended. You cannot house stick insects and leaf insects together, as the stick insects will eat the body of the leaf insects when food is scarce. Males and females are easily distinguishable. Females are larger and broader, while males are much narrower. When adult, the males have long wings and long antennae. The males have very long antennae, around 3.5 cm, while women have antennae of around 1 cm. The males and females can just be kept together, they will mate when they are ready. The female will drop her eggs to the ground. The eggs are brown cones with fine spiny hairs. When the environment is not humid enough, the spines will not stick out so much. The hypothesis is that the spiny hairs function to attach the eggs to passing animals to spread the eggs. You can collect the eggs and place them on moist tissue paper. This should always remain moist but not really wet. Keep the eggs at around 26 ° C. Watch out for mold! If mold occurs, the eggs will die. The best way to prevent mold is allowing the moist paper to dry before spraying with water again. The eggs hatch after around 4 to 5 months. The nymphs are black-grey in color when they are just born. After their first molt they will become light green in color. Young nymphs are very sensitive to humidity and temperature, so it can be a challenge to raise them.